The traditionally conservative International Energy Agency (IEA) predicts the cost of solar energy will fall to around 4c/kWh in coming decades as the sun becomes the largest source of power generation across the world. 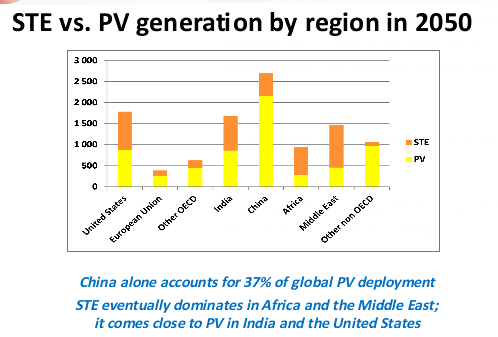 The latest “Solar Roadmap” published by the IEA on Monday shows that the speed with which solar is reaching “socket parity” has taken the world by surprise, writes Giles Parkinson of Reneweconomy.com.au. Energy transition = storage transition. After dark, the output of solar panels is zero. But a modern society needs power around the clock. Therefore the storage of energy is the main point, not the panel or the generator. Even with zero costs per kWh solar power without storage will be expensive because of standby fossil fuel power plants and transition is not taking place. People have been saying that for decades but if you have no power at all even electricity during the day is better than nothing. Besides Africa and the 3rd world are innovating in all sorts of chemical, mechanical and hydro storage solutions. Using phone batteries to run lights at night and so on. Kerosene lighting cost so much that reducing its usage saves families immense amounts of their income. coal will last for at least one more century. solar is nice, but Household technology. Our society needs mining, concrete and steel production, transportation : ships, airplanes, trains and chemical industry. Also agriculture needs energy. Failing to generate this energy will lower welfare and threathen our existance. There is no substitution yet for fossile fuels. But because they can supply our energy for 1 or 2 more centuries, there is no big hurry for a real transition. Better is to do research and make decisions later. Will save a lot of money. It wouldn’t be a hassle if all the worlds grids were connected, then the problem would be transference. In a world running out of cheap oil we may be facing our greatest challenge, that of global harmony as we race to join the smart grid infrastructures together. Good Luck. big grids are extremely expensive. There is a general tendency to use local power, cordless equipment. Central steam engines in factories were once replaced by electrical motors. So, in the far future it is more likely that energy is supplied by small local (nucleair) power plants. And nucleair is the only energy source that can replace fossile. The Energy Transition doesn’t need storage for decades. The basic plan is to install a lot of solar panels and wind turbines, close down a lot of fossil plants and tweak the market structure. David we consume much more energy during the day, so solar power fits well to cover the peaks. The hidroelectric + gas are usually used to cover those peaks now that the solar is only a fraction of the production. This is actually happening in some european countries: nuclear, coal and fuel are producing at a stable rate, while gas and hidroelectric varied wildly to adapt to the daily cycle. When the wind blows, the gas and hidroelectric slow their production. Thanks to the solar, the daily peak is very softened for the other energy sources. Now the future: couple some solar with reversible hidroelectric power plants… and there you have your storage. Vanadium, kinetic, and ice batteries are all out there and offer a lot of ability to balance load. 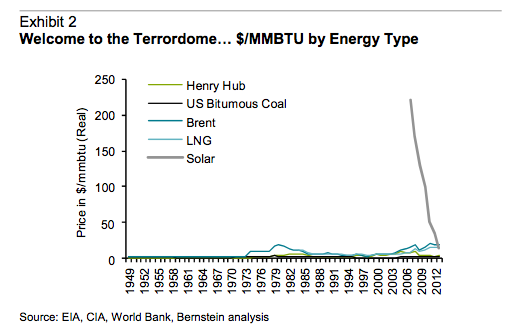 Also wind and solar tend to be counter cyclical. This article is unbelievable. The Ivanpah solar thermal plant started operating in CA last spring. It costs $2.2 billion for 390 MW without storage. Electricity is being sold from the plant at 19 cents per kw-hr and this plant had huge subsidies. For solar to make the impact suggested in the article, technological changes we have not heard of must develop. IEA is hilariously wrong all the time. search graph-of-the-day-why-experts-get-it-wrong-on-wind-and-solar-58816 Greenpeace has nailed it every year for predicting solar and wind and IEA has gotten so wrong it’s funny. Why you should never trust political agencies! Solar will replace 150% of peak power and 60% of total energy demand by 15 years. Wind will supply 10-20% that solar does not, and hydrocarbons from wastes will back it all up.